Wanted to lock folder but not having essential software to use? Don’t worry here i tell you the simplest method to lock folder in any your computer’s drive. 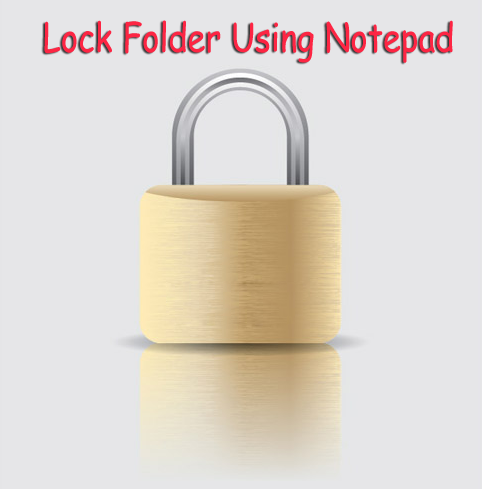 With notepad you can lock any of the folders without getting worry of forgetting password, limit of software , etc. Just follow these steps and you’re done. Suppose you want to lock any folder name wallpaper in drive F: whose path is F:wallpaper. Then open notepad and copy this code. If wallpaper is your folder name then saves it as lock.bat in the same drive. Now open another notepad and copy this code. Again save it as key.bat in the same drive and you’re done. Just you need to follow these 2 usages to run this trick. 1)To lock it simply clicks on loc.bat file. 2)To unlock it simple click on key.bat file. Old one but thanks for sharing. It will be helpful to them who forgot the trick. Its working fine for me. It works, can't even imagine we can lock our data in folders with notepad, amazing i like your share.